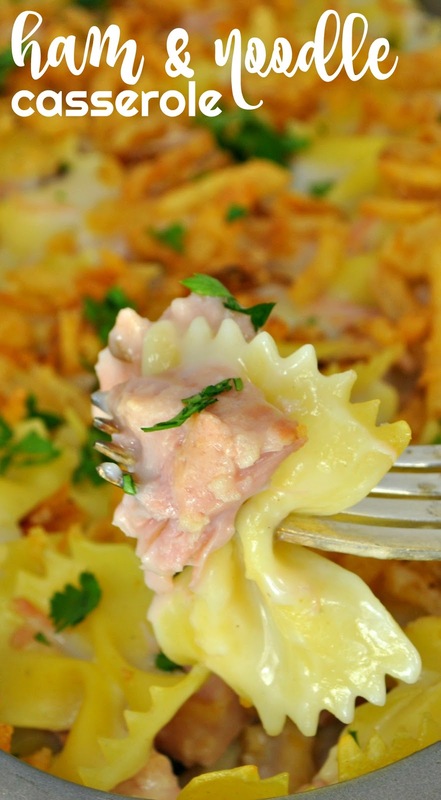 Food Hussy Recipe: Ham + Noodle Casserole | The Food Hussy! I've been cooking since I could reach the stove. We didn't have a pot to piss in (as my Dad would say) and we had to make budget-friendly meals. He had huge three-ring binders of recipes - and he was a bit OCD - so ever since I could write - I could hand copy recipes from magazines to paper and put them in the binder. He would leave comments on them for the next time and categorize them - it was a part-time job for me! As part of that - I learned how to cook at a young age. Early on, I would have dinner ready when he got home from work. This was the first meal I learned how to make! I learned how to make it using tuna - but later in life - I realized that I like canned ham way better than canned tuna. That said - you can use either. It's a super simple recipe - but it's definitely a comfort food for me since I've made it probably 1000 times. We always made this Tuna Casserole (or now - Ham Casserole) with egg noodles but - as you may know - my husband is allergic to eggs - so I substituted bowties and it was just as tasty. Other than the canned ham and the bowties - the ingredients are super simple: cream of mushroom soup and milk. I did add those yummy fried onions on top and a bit of parsley. Other recipes have peas and cheese but I'm good with this as is. The ham adds texture and a bit of saltiness which I love. My favorite casserole but with a twist!